A Christmas Carol (1971) is an Academy Award-winning animated adaptation of Charles Dickens's 1843 novella. It was a television film originally broadcast on ABC in the United States, but it was subsequently released theatrically. 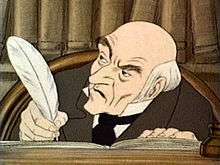 A Christmas Carol was directed by Richard Williams and its visual style is also largely due to Ken Harris, credited as "Master Animator". It starred Alastair Sim as the voice of Ebenezer Scrooge — a role Sim had previously performed in the 1951 live-action film Scrooge. Michael Hordern likewise reprised his 1951 performance as Marley's Ghost in the same film. Michael Redgrave narrated the story and veteran animator Chuck Jones served as executive producer. Williams' son Alexander Williams, then aged four, provided the voice for Tiny Tim. This adaptation of A Christmas Carol has a distinctive look, created by multiple pans and zooms and by innovative, unexpected scene transitions. The visual style, which is unusually powerful, is inspired by 19th century engraved illustrations of the original story by John Leech and the pen and ink renderings by illustrator Milo Winter that graced 1930s editions of the book. The intended audience does not include young children, and the film's bleak mood and emphasis on darkness and shadows lead some to consider it the most frightening of the many dramatizations of the Dickens classic. Originally produced as a 1971 television special, A Christmas Carol was considered so well done that it was subsequently released theatrically (thereby rendering it eligible for Oscar consideration). The film did in fact win the Academy Award for Best Animated Short Film for 1972 and to this day remains the only film adaptation of Dickens' story to be so honored. Some industry insiders, in fact, were so unhappy that a short originally shown on television was given the award, that the Academy changed its policy, disqualifying any future works initially shown on television.